Cut Kumato® brand Tomatoes into halves and gently squeeze out seeds, straining out seeds to reserve the juice. Toss all ingredients together gently in a bowl to mix well, adding the reserved juice from the tomato seeds. Season with salt to taste. Keep refrigerated until ready to serve. 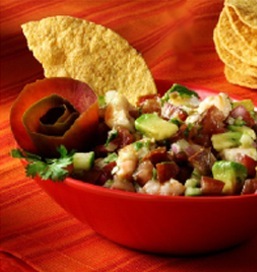 Serve with tortilla chips as an appetizer or with tostadas as a light meal. Keep the ceviche covered with plastic wrap until serving to prevent the avocados from browning. The tomato juice helps preserve their color.